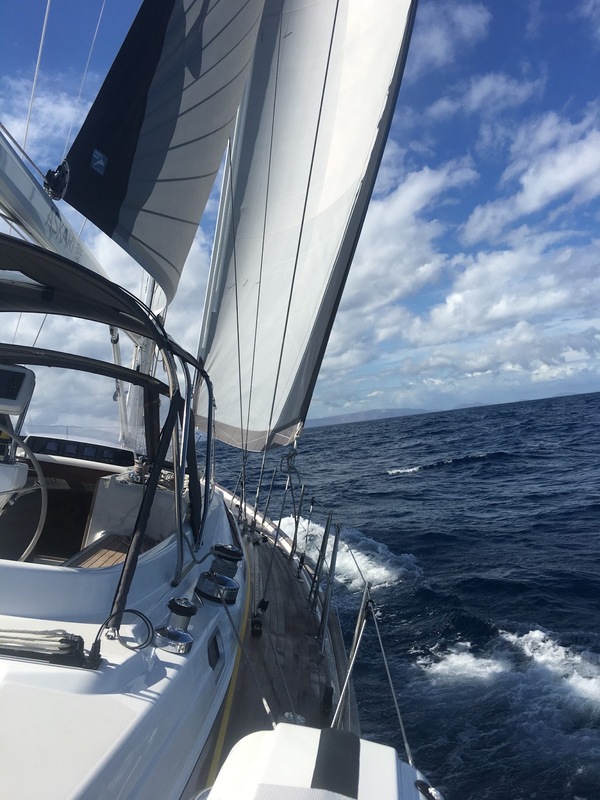 The trip down to the Canaries should be fairly straight forward; northerly winds prevail although the swell can be an issue and squall lines and acceleration zones are common as you approach the islands. We know this well from our last trip 12 years ago to this part of the world where a squall line blew out our main sail as we approached Lanzarote. However, with a huge low pressure system north of us the wind had all been sucked away and we were initially left with no wind and calm seas but then it all changed. Our first night after leaving Rabat was so calm; we both caught up on sleep. I cooked an amazing brunch (if I do say so myself) on Friday morning – sausages, eggs, homemade hashbrowns, mushrooms with fresh thyme and roasted tomatoes. We still were on careful watch for local fishermen, and a few boats came quite close – I always keep a low profile or if I am on watch put on hat and jacket. However, one boat came right up to Askari and the guys held up a huge red fish to Andrew – it looked amazing but he wished them well and they gave big waves back. A few hours later, late afternoon on Friday we past by a huge pod of pilot whales – we really considered turning around to spend time with them but we had to keep pressing on. We noticed it had got quite a lot warmer and did our night shifts in shorts n t-shirts – oh yes this is what we like…. Saturday, we noticed a change in current and were now fighting up to a knot against us; the cloud then started to increase and the wind picked up to force 4 from the South West (exactly where we were trying to go). As the sea picked up we had no choice but to turn south and try and keep the heading with the motor on but before long we realised this was eating up too much fuel and having spent two days under engine we had less than half our tank left. Oh gosh who thought it was a good idea to go to Morocco??? We spent most of Saturday sailing into the wind with a very ugly sea; it was now force 4/5 and we were only making a 2 miles an hour in the right direction. We didn’t go backwards and did get the chance to try lots of different sail set ups but it was so frustrating. If we didn’t know that massive 4 to 5 metre swells were heading our way and that potentially the low pressure could come this way we could have just relaxed and enjoyed the sail but it was front and centre and every weather forecast we brought in showed a huge pink (bad) system just north of us tracking south. By 7pm on Saturday we had achieved about 40 miles in 12 hours, we still had 140 miles to go so to cheer us up I made what I have now called a Virgin Ridiculous GnT (basically Tonic and Lime with ice n a slice for our dry boat on passage) however the boat moved and both drinks emptied themselves inside a locker – oh bloody hell when do we get a break??? So we had a glass of water and Andrew dipped the fuel tank. 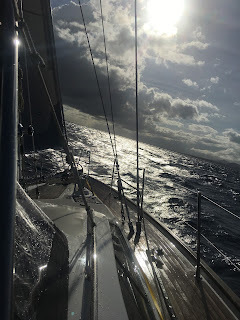 The wind had eased enough for us to power directly towards Lanazrote even though it wasn’t pretty or comfortable we felt under a lot of pressure to use what ever resources we had to get South and away from the low. Sunday morning the sea was fairly calm and we managed to keep heading in the right direction until mid morning when the wind picked up again from the South West and pretty strong by 11am. We were now very low on fuel – 110 Litres but we realised that with any heel on the boat, our tank having such a large base, the fuel draw pipe was out of the diesel and we didn’t want to risk getting air in the system. After our experience yesterday we now thought there was no hope of getting in that day but resolved to beat our way the last 30 miles towards Lanzarote which was now in sight. We removed our inner forestay to allow us to tack with more ease and spent ages getting the sails perfectly balanced – we had a lot of fun at first really getting the boat going; we each had a spell on the helm despite being pretty tired, being able to see the destination even if you can’t get there was such an incentive. 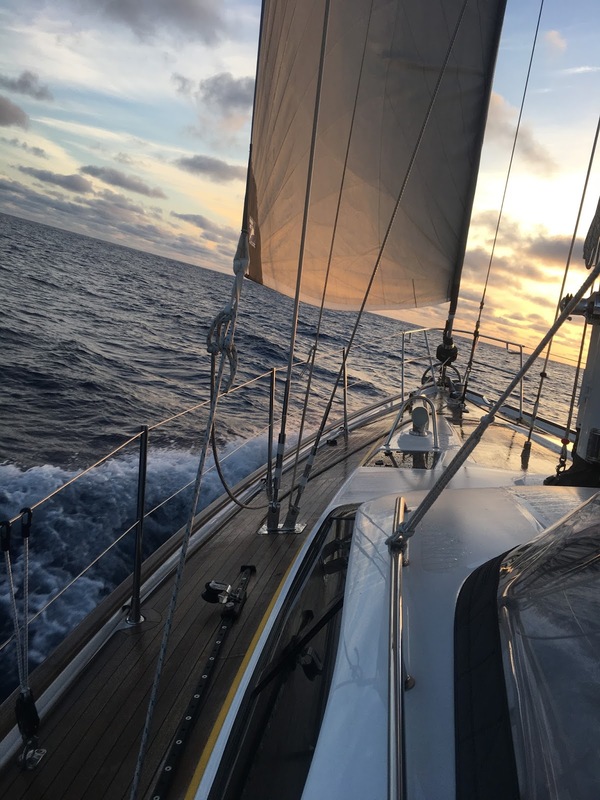 A French yacht sailed across us and took a long tack out of sight, while we choose to short tack along the coast – managing the angles all the way (this was serious now and we were in a race with a Frenchman). Andrew noted a building squall line that could change things - so we were keen not to get too far from the lea of the island even if it meant gusty conditions. By 4pm we still had 13 miles to go, a pod of Dolphins came to play and then we noticed the wind was doing strange things before we found Askari round up and the squall line past right over us and change the wind direction by 180 degrees and increased to 25 knots creating an instantly awful sea but we could now lay Arecife Harbour – Oh My goodness talk about being in the right place and the right time. We look up and our French friend who was heading in ahead of us a few minutes before was now on the other side of the line as we creamed in to the coast near the harbour entrance and calm seas. The next concern was would there be air in the fuel system, we decided we would rather find out outside the harbour so we furled the sails and I prepared the anchor while Andrew removed the floor boards to see the full system. I motored cautiously down the 10 metre contour where we knew we could anchor and Andrew monitored everything. To our surprise despite the fuel pickup being completely out of the fuel for much of the previous day we had no air in the system, but only about two inches of fuel in the bottom of the tank – even though that was 100 Litres. We already had the marina instructions, and a quick call on the radio allocated us a berth. The wind was still very gusty and a strong current was running this made getting into the berth between two pontoons with spikey metal ends a real challenge – oops our first little scratch on our beautiful Oyster shell – it’s only small but the first cut is certainly the deepest and it just was the icing on the cake for this trip. Oh gosh we were so exhausted and just collapsed with a beer in the cockpit – ‘relief’ was the word that we agreed summed up how we felt. Then in bounced the fabulous Fi from Supertramp – a bottle of wine later and the pain washed away. We learned so much about the navigation systems on board especially in fog, how to really sail Askari to windward and finally the fuel system on this trip. Askari was amazing and we did pretty well, despite probably making a silly choice at the outset to leave with a bad weather system bearing down on us for our first big trip. However, it feels great to be here now and nearly everyone we have spoken to had an awful trip down here this week too; which creates a great camaraderie. I said our most challenging trip – in that it was psychologically challenging more than anything due to the fuel and imminent weather. Now to exploring Lanzarote – although we have another Southerly gale to pass through this week then hope to be back into summer and maybe get to visit La Graciosa – the place that really started our adventures 12 years ago; although we need to get a permit now so things have changed a bit! Looks great Andrew and Carolyn, safe travels.